I recently read a book, Freakonomics and found the author's arguments quite interesting. In here, I just try to share some of the topic related to parenting technique. I hope parents can enjoy it. The fast-track nursery schools and the "gifted and talented" public schools and the Ivy League colleges have mailed their acceptance letters, and parents everywhere are either a) congratulating themselves for having shepherded their children into the dream school or b) chiding themselves for having failed. In the first case, the parents may tell themselves: It was those Mozart quartets we played in utero that primed her for success. In the second case, they might say: I knew we shouldn't have waited so long to get him his first computer. But how much credit, or blame, should parents really claim for their children's accomplishments? The answer, it turns out, is a lot � but not for the reasons that most parents think. » Matters: The child has highly educated parents. » Doesn't: The child regularly watches TV at home. » Matters: The child's parents have high income. » Doesn't: The child's mother didn't work between birth and kindergarten. » Matters: The child's parents speak English in the home. » Doesn't: The child's parents regularly take him to museums. » Matters: The child's mother was 30 or older at time of the child's birth. » Doesn't: The child attended Head Start. » Matters: The child's parents are involved in the PTA. » Doesn't: The child is regularly spanked at home. Now, back to the original riddle: How can it be that a child with a lot of books in her home does well at school even if she never reads them? Because parents who buy a lot of children's books tend to be smart and well-educated to begin with � and they pass on their smarts and work ethic to their kids. (This theory is supported by the fact that the number of books in a home is just as strongly correlated with math scores as reading scores.) Or the books may suggest that these are parents who care a great deal about education and about their children in general, which results in an environment that rewards learning. Such parents may believe that a book is a talisman that leads to unfettered intelligence. But they are probably wrong. A book is, in fact, less a cause of intelligence than an indicator. The most interesting conclusion here is one that many modern parents may find disturbing: Parenting technique is highly overrated. When it comes to early test scores, it's not so much what you do as a parent, it's who you are. It is obvious that children of successful, well-educated parents have a built-in advantage over the children of struggling, poorly educated parents. Call it a privilege gap. The child of a young, single mother with limited education and income will typically test about 25 percentile points lower than the child of two married, high-earning parents. So it isn't that parents don't matter. Clearly, they matter an awful lot. It's just that by the time most parents pick up a book on parenting technique, it's too late. Many of the things that matter most were decided long ago - what kind of education a parent got, how hard he worked to build a career, what kind of spouse he wound up with and how long they waited to have children. The privilege gap is far more real than the fear that haunts so many modern parents - that their children will fail miserably without regular helpings of culture cramming and competitive parenting. So, yes, parents are entitled to congratulate themselves this month over their children's acceptance letters. But they should also stop kidding themselves: The Mozart tapes had nothing to do with it. 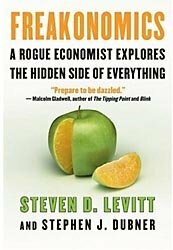 Stephen J. Dubner and Steven D. Levitt are the authors ofFreakonomics: A Rogue Economist Explores the Hidden Side of Everything. hi, i find that this article is really interesting. after reading it, I am not guilty for having so many books at home haha. I will also make sure I earn lots of money and create a good environment to my kids. no one should ever feel guilty of having too many books and honestly, there's no such thing as too many books. modern parenting uses too much technicality and depending on how-to books and it does help, but i guess while parents are busy reading, they tend to miss the actual raising of the child, which they will later on wonder where did they go wrong, which will have them reach another book for answers. [cont. frm prev entry] its like you're camping in the woods with friends, but you say you want stay in the tent reading a good book about the wondrous of nature & the outdoors, rather when you can really experience it there and then. being good parents is letting your kids know they can find a friend in you. most of all parents should know that, they are what happened to their kids and follwing their own instinct rocks. the whole thing about listening to the classical music or reading/talking during pregnancy is so misunderstood. those things results in interaction, and helps with early brain development. its funny how silly and twisted these facts get..